The largest, most anticipated VIP event of the upcoming year is scheduled for February 4, 2018. Minneapolis, Minnesota will host Super Bowl LII; which draws athletes, entertainers, influencers, enthusiastic fans and an endless number of private jets. If you choose to charter a private jet to Super Bowl, here are four points to keep you winning— from every takeoff to every touchdown— airport field to football field. “The total amount of private jets that travel to the Super Bowl each year is huge,” says Cliff. “If you can, have your pilot choose an alternate airport to fly into.” If there are more options of airports, with long enough runways and in close vicinity to the game, consider the alternative. If the drive time is slightly longer, but the waiting period on the ramp is shorter, it may be more convenient to choose a secondary airport. To miss the private jet rush to Super Bowl, on both departure and arrival, leave at off-peak times. If you would like to depart the same day, be prepared for anything to happen or possible delays. No need to worry if you do need to fly the day of the event. Your Clay Lacy crews know how to make game-day safe, fun and memorable no matter which team wins. “The Super Bowl is an exciting event as Clay Lacy Cabin Servers go out of their way, based on client preferences, to create a fun inflight travel atmosphere,” says Elizabeth. Cabin servers often bring the ‘game to the plane’ through festive and fun décor, food, and beverages. 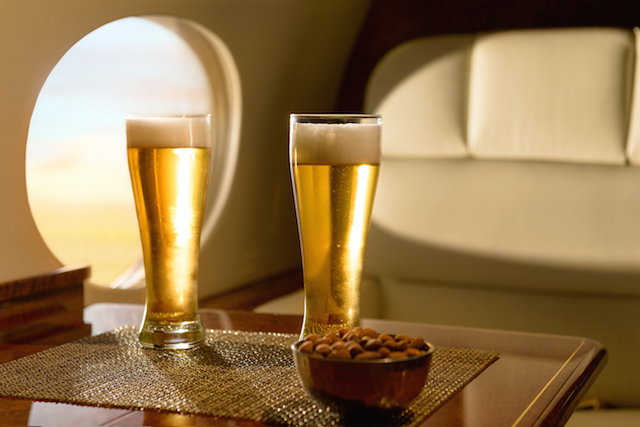 Indeed, there is no better way to enjoy the Super Bowl experience than chartering a private jet. Interested in booking your Super Bowl travel with Clay Lacy? Contact a Clay Lacy Charter Coordinator today for the widest selection of aircraft.